CLADDAGH gold rings from Ireland. All of our Clogau rings have BRITISH hallmarks as well as the Dragon mark and come with certificate of authenticity. Quoted weights are accurate to 0.1 grammes, quoted measurements to 0.1 mm. Scale shown is in millimeters. To capture the fullest detail possible, all photos have been taken at an angle. METAL: Gold 375, (rose and yellow). SIZE (UK, approx. ): O 1/2. INSIDE DIAMETER (approx. ): 17.7 mm. OUTSIDE DIAMETER (approx. ): 21.6 mm. 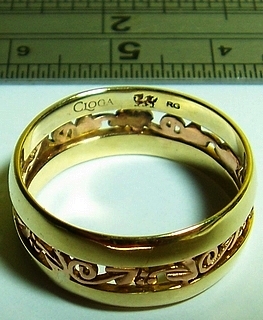 This ring comprises two bands of gold, one rose, one yellow, in the Clogau Tree of Life pattern. Every Dragon-marked item contains Welsh gold from the Clogau mine. Clogau - Dragon - CG - 375 - Castle. DATE OF LISTING: 23 JANUARY 2018. OUTSIDE DIAMETER (approx. ): 19.0 mm. This ring comprises two bands of yellow within which is a rose gold frieze of the Clogau Tree of Life pattern. This was issued as a limited edition item by Clogau. In addition to the Clogau mark and dragon, there is a full assay mark, but this is too small to show as an image. INSIDE DIAMETER (approx. ): 18.6 mm. OUTSIDE DIAMETER (approx. ): 21.9 mm. MAXIMUM DEPTH (approx. ): 6.7 mm. This ring comprises a shank of yellow gold upon which is the Clogau Tree of Life pattern in rose gold. It has fine hallmarks, including the "millennium cross", stamped on gold in 2000. All Dragon-marked items contain Welsh gold from the Clogau mine. CG (Clogau) - 375 - Rose - Crown - Z - Millennium Cross 2000. SIZE (UK, approx. ): R 1/2. INSIDE DIAMETER (approx. ): 18.8 mm. OUTSIDE DIAMETER (approx. ): 23.3 mm. MAXIMUM DEPTH: 4.7 mm (front). This ring comprises a single band of rose gold, with the Clogau Tree of Life pattern superimposed in yellow gold. All Dragon-marked items contain Welsh gold from the Clogau mine. INSIDE DIAMETER (approx. ): 18.0 mm. OUTSIDE DIAMETER (approx. ): 23.0 mm. MAXIMUM DEPTH: 5.2 mm (front). This ring comprises a single band of yellow gold, with the Clogau Tree of Life pattern superimposed in rose gold. All Dragon-marked items contain Welsh gold from the Clogau mine. CG - 375 - Rose - Crown - Dragon. METAL: Rose gold 750, (18 ct). INSIDE DIAMETER (approx. ): 19.1 mm. OUTSIDE DIAMETER (approx. ): 21.8 mm. MAXIMUM DEPTH: 2.4 mm (front). This ring comprises a single band of 18 carat rose gold, with the Cariad legend engraved within. All Dragon-marked items contain Welsh gold from the Clogau mine. CG - 375 - Rose - Crown - C - Dragon. 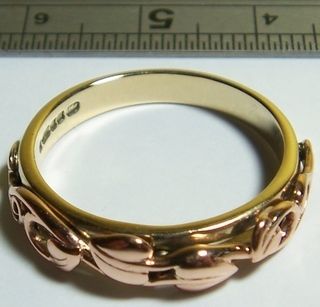 METAL: Yellow and Rose gold 375, (9 ct). INSIDE DIAMETER (approx. ): 17.0 mm. OUTSIDE DIAMETER (approx. ): 21.5 mm. MAXIMUM DEPTH: 4.2 mm (front). This ring comprises an intertwined rope twist design comprised of 9 carat yellow and rose gold. A substantial ring. All Dragon-marked items contain Welsh gold from the Clogau mine. CG - 375 - Rose - Crown - Dragon (worn). INSIDE DIAMETER (approx. ): 19.8 mm. OUTSIDE DIAMETER (approx. ): 21.0 mm. MAXIMUM DEPTH: 6.0 mm (front). This unusual ring comprises a single band of 9 carat yellow gold, into which is inscribed the Cariad legend in an ivy design made of rose gold. It also incorporates an optical illusion: at a certain angle, when looking at the hallmark, the word Cariad appears and remains seemingly static even as the ring is turned. Beautiful! with "floating Cariad" illusion shown. Suffragette Movement 15 carat gold rings from the Victorian era. Green, white and violet: The colours of the Suffragette Movement as they stand for Give Women the Vote. The Suffragette Movement fought for Women's rights during the Edwardian era. This 15 carat gold ring carries the British Suffragist colours: green emeralds, white seed pearls and pink tourmalines, all set into a 15 carat gold ring of elaborate design and fully hallmarked for 1897. METAL: Gold .625 (15 carat). STONES: 2 pink tourmalines, 3 emeralds and 8 seed pearls. WEIGHT: 3.3 grammes, (including stone). SIZE (UK, approx. ): P 1/2. OUTSIDE DIAMETER (approx. ): 22.0 mm. SHW - 15 - 625 - Anchor - e.
Claddagh gold rings originated in Ireland. The Claddagh's distinctive design features two hands (one male, one female) clasping a heart, and usually surmounted by a crown, corresponding to the qualities of love (heart), friendship (hands), and loyalty (crown). METAL: Gold .375 (9 carat). INSIDE DIAMETER (approx. ): 17.5 mm. OUTSIDE DIAMETER (approx. ): 19.5 mm. HEART & CROWN DEPTH: 11.5 mm. OC - Man and staff - Gaelic T - 9 - 375. PLATINUM (or "WHITE METAL" if not UK hallmarked) RINGS. All of our platinum rings have full BRITISH hallmarks unless otherwise stated. If they have marks which are not British, then they must be sold as "white metal" to conform to hallmarking legislation. METAL: "White Metal". Marked Pt950 with a CB and tree mark. INSIDE DIAMETER (approx. ): 21.0 mm. OUTSIDE DIAMETER (approx. ): 24.5 mm. 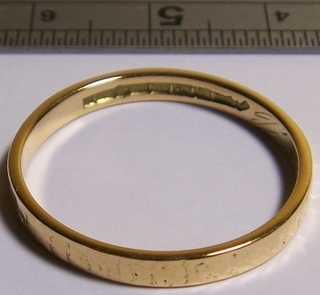 All of our gold rings have full BRITISH hallmarks unless otherwise stated. METAL: Gold .999 (24 ct). OUTSIDE DIAMETER (approx. ): 20.5 mm. B BROS - 999 - Leopard head - a. SIZE (UK, approx. ): Q 1/2. INSIDE DIAMETER (approx. ): 19.0 mm. OUTSIDE DIAMETER (approx. ): 20.1 mm. H.A - Crown - 22 - Anchor - q. SIZE (UK, approx. ): K 1/2. INSIDE DIAMETER (approx. ): 16.1 mm. OUTSIDE DIAMETER (approx. ): 19.2 mm. H.A - Crown - 22 - Anchor - Z.
HS - Rose - Crown - 916 - A. INSIDE DIAMETER (approx. ): 15.5 mm. OUTSIDE DIAMETER (approx. ): 18.5 mm. HG&S - Crown - 22 - Anchor - T.
METAL: Gold 916 AND Platinum 950. OUTSIDE DIAMETER (approx. ): 20.0 mm. K&D - PLATINUM - 22ct. K&D - B - Crown - 22 - Leopard. METAL: A Finnish yellow gold .750 (18 ct) ring with very lightly chased bark pattern. SIZE (UK, approx. ): S 1/2. INSIDE DIAMETER (approx. ): 19.5 mm. The mark is sharp, but it is hard to get a satisfactory image. Kruunu - Koro mark - 750 - Crown - Caigh - R7 (1970) - FINLAND - Unknown mark. Inscription, believed to be "Pertlu 9.8.71"
METAL: Rose gold .750 (18 ct) rope design on yellow gold .750 (18 ct). SIZE (UK, approx. ): M 1/2. LSD - Crown - 750 - Leopard head - W.
METAL: Yellow gold .750 (18 ct) complex flower design. KBSP - Crown - 18 - Anchor - V.
METAL: Yellow gold .750 (18 ct) diamond-cut diagonal stripe design. SIZE (UK, approx. ): N 1/2. QVC - 750 - Anchor - b. METAL: Gold 750 (18 ct). STONES: 4 Rubies and 3 white diamonds. DIAMOND CARAT: 0.25. WEIGHT: 3.6 grammes. METAL: Gold .375 (9 ct). SIZE (UK, approx. ): H 1/2. INSIDE DIAMETER (approx. ): 16.0 mm. OUTSIDE DIAMETER (approx. ): 18.0 mm. GJ - Scales 375 - 375 - Anchor - DIA.